Please note that stores have different opening times. Please visit the store directory for more information. 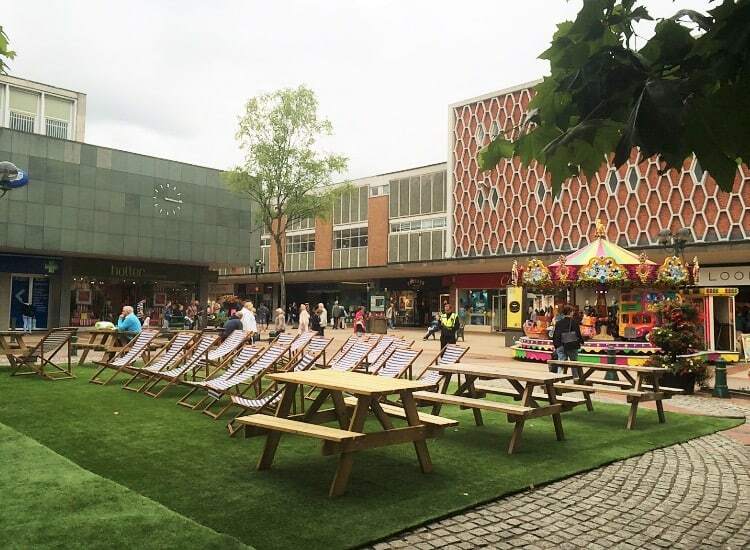 Mell Square is located in the heart of Solihull town centre. Whether you’re travelling by car, bike, bus, train or on foot, Mell Square is easy to find. Mell Square has over 1,500 parking spaces, including disabled spaces, parent and child parking, and free secure bicycle parking. If you’re a Sainsbury’s customer and have spent more than £25 in a single purchase at their Poplar Way store, Sainsbury’s will pay £2.50 (the first 2 hours of your stay). There are spaces reserved for disabled badge holders at Mell Square Car Park (plus disabled lifts and disabled toilets), Marks & Spencer Car Park and Lode Lane Car Park. Disabled parking is also available on Mill Lane and Drury Lane. Bicycle parking is provided in Mell Square and Mell Square Car Park. Parent and child parking is available at Marks & Spencer Car Park (Level 2). There are a number of other car parks nearby. Visit the Solihull Town Council website for more information. First aid – You are in safe hands at Mell Square with a number of fully trained first aiders on site at the Management Centre. Cash machines – You can access free-to-use cash machines outside Marks & Spencer, Mill Lane, outside BHS, Mell Square, in Barclays Bank, Mell Square, RBS on the High Street, and Lloyds Bank on Poplar Road. Toilets and disabled toilets – Toilets (including disabled toilets) can be found at the entrance to Mell Square Car Park. Accessibility – At Mell Square we endeavour to understand all of our customers’ needs to make your shopping experience smooth, simple and enjoyable. Mell Square is wheelchair-friendly. Disabled parking – There are spaces reserved for disabled badge holders at Mell Square Car Park, Marks & Spencer Car Park and Lode Lane Car Park. Disabled parking is also available on Mill Lane and Drury Lane. Although Mell Square does not have a Shopmobility unit, there is a Shopmobility service within the Touchwood Shopping Centre. The Touchwood Shopmobility service is located in the Orange Welcome Hall. Guests wishing to hire equipment must register with the service. This can be done at the Shopmobility reception desk. Registration to the service is free of charge. Scooters and wheelchairs are available to hire free of charge. Please note that standard parking fees apply from the time of entry to the Touchwood Car Park. Bookings can be made in advance by contacting the Shopmobility Helpdesk on 0121 709 6900 (please select option 2) or emailing shopmobility@touchwoodsolihull.co.uk. Alternatively, equipment can be hired on arrival at Touchwood on a first come, first served basis. Please visit www.solihull.gov.uk/shopmobility for more information. Mell Square is located off the M42 via junction 5, follow the signs to Solihull town centre. Alternatively take the A41 from Birmingham into Mell Square. Regular bus services connect Solihull to most of the West Midlands. 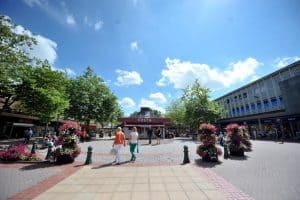 Mell Square is a leisurely ten minute walk from Solihull Railway Station. Solihull is on the Birmingham Moor Street Station to Leamington Spa line. Services operate from Birmingham at least every twenty minutes. There is an hourly service between Solihull and London Marylebone and between Solihull and Worcester. For all train enquiries, please call 0345 484 950 or visit www.nationalrail.co.uk. There are a number of taxi services in Solihull. The nearest taxi ranks are on Mill Lane and Poplar Road.